The WYSIWYG "editors" for posting blogs in Blogger or WordPress are pretty slow. You need to login to the administration page whenever you need to write a new post. Blogger does provide a plugin for Microsoft Word, however you cannot post documents with images. 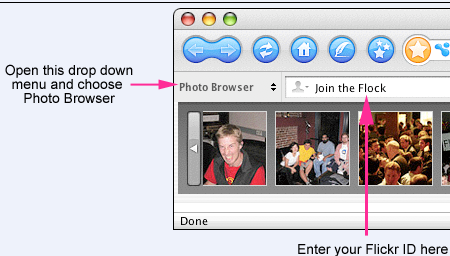 Flock provides a "Photo Browser" page and you can sign in using your Flickr Id to browser your albums. Then you have a "Photo Uploader". Just drag the image onto the widget and click on the "Upload" button. The image is uploaded to your Flickr account. You can configure your blogs (either blogger or WordPress) from the Tools -> Options -> Accounts menu. 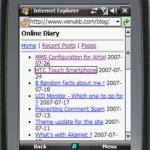 All the posts from the blog are listed in a widget. If you want to modify an existing blog, click on it and the post is opened in a WYSIWYG editor. Once you are done modifying the post, just click on "Post" to publish the blog. You can also "Save" the blog. (However this is a local draft and cannot be accessed from other places). One nice feature is that you can open the "Photo Browser" widget and drag the pictures onto the blog. So adding images to blog is now much more simpler. And for WordPress users who are reprieved of spell check, the editor comes with a spell check utility. Flock imports your del.icio.us or Shadows favorites, and syncs up your local favorites with your online ones. Each time you star a page as a favorite, it is added to both your local and your online list. Why should I move to Flock? If you are a Firefox user, then most of the good things you like about Firefox are also present in Flock. And if you are a blogger, it does provide with some nice feature which easer your task of "Blogging"
Aren’t there other nice tools for Blog Management ? Yes I found one more nice tool (which in fact was used to write this post 🙂 ) please subscribe or keep pinging my site for more details on that. And if you guys are aware of other nice tools for blog management please let me know. Glad to hear you’re liking Flock. Our first beta release, Cardinal, is coming out later this month. If you like it now, we’re hoping you’ll love it then. Anything we can do to make Flock better? Just let us know. Thanks for the response. Yeah I do have a few suggestions but I would wait for the Cardinal release.